Regardless of the project, we take pride in doing a good job at a fair price and cleaning up after ourselves. When you hire us, your job will be done the way you want it done! 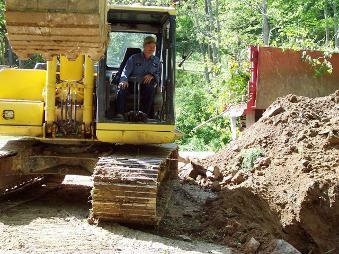 Site preparation and road building are our specialties, with a large selection of equipment to meet every need. We excavate basements, install driveways, septic and drainage systems, retaining walls and ponds. If rock is an issue on your site, we have contacts for professional blasting. We haul gravel, pour concrete — pretty much anything you need done. In addition to public roadwork, we maintain private gravel roads, driveways and drainage systems. Steep grades and severe weather are part of mountain life, and we have what it takes to keep the local roadways safe and useable. Pangle’s can help you keep your property secure, attractive and accessible all year-round. Our property management services include seasonal and annual maintenance programs to fit your needs. We believe in doing the job the way the customer wants it done. We are more than happy to come out and look at your site and give you our honest opinion about how we can get your project completed to your satisfaction. Give us a call or send us an email. We look forward to serving you!